With the third Samsung Galaxy Note almost upon us and LG having just revealed the gigantic Optimus G Pro, the phablet season has well and truly arrived. 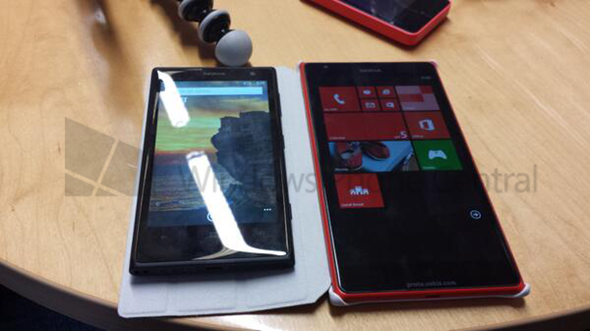 Nokia, one of the few companies yet to delve into the world of preposterously large smartphones (or tiny tablets, depending on your point of view), is rumored to be plotting its inaugural effort with the Lumia 1520, and today, an alleged snap of what appears to be a working unit has been spotted in the wild. It’s one of those leaks where, if it is indeed real, we certainly wouldn’t have baulked at a video demonstration. With that said, it’s one of the first plausible sightings of the device, and with Lumia devices struggling against a tidal wave of iOS and Android-based handsets, Nokia is trying to cover every corner of the market in its continuous catch-up efforts. According to a report over at WP Central, the source of this particular leak, the Lumia 1520 will boast a 6-inch display, eclipsing the amount of real estate offered by both Galaxy Notes released hitherto. Naturally, the screen goes the whole nine yards with a full-HD 1080p resolution, although beyond that, precious little else is known of the Finnish company’s next big thing. Apparently, it will pack in a high-end Qualcomm Snapdragon SoC, and considering most phablets on the market, save the Galaxy Mega, are all running powerful chipsets, we’d suspect this rumor to be true. Nokia has prided itself on ensuring most of its handsets feature a better-than-the-rest camera, and while Windows Phone will remain a stumbling block for the Lumia 1520, some may be cajoled by a device with a high-end camera and a large display. The device is still not confirmed, although numerous reports have pointed to a launch at some point next month, just before Microsoft announces Windows 8.1. Also, we covered a report a few weeks back which also suggested that a Nokia phablet is to be released this year, and therefore, keeping today’s leak in mind, we’re certain this could be it. It’s easy to write off such a large device, particularly one on a platform that is currently, despite its inherent strengths over rivaling ecosystems, tanking. But hey, when the first Galaxy Note arrived, people laughed it off, and the rest, as they say, is history. Still, it will be interesting to see what the reaction will be to a 6-inch device from Nokia, and we’ll keep you posted on any more interesting tidbits regarding the Lumia 1520.